October was one hectic month at our household. Hope everyone had a good Dushera festival and Eid. With upcoming Diwali, I thought it would be nice to celebrate it on my blog. 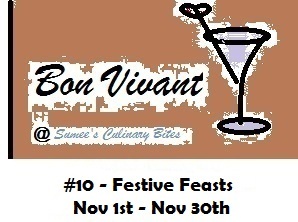 So all month long it will be festive feast @Sumee's Culinary Bites. Whatever you cook/ bake or put together for the festivity can be linked up below. Have a blast all month long. Happy festivites!! ~ Blog post should be in month of November. ~ Two old posts are allowed, if re-posted again in November.